Hear about travel to Cincinnati, Ohio as the Amateur Traveler talks to Erin Hinsen and Seth Walsh from UnlockCincinnati.org about the Queen City. Cincinnati has a number of neighborhoods. We talk about downtown, and OTR (Over-The Rhine), Camp Washington, Clifton and the Gaslight District, Mount Airy, The Banks and more. Erin and Seth describe a city that is revitalizing it’s downtown and its historic buildings. 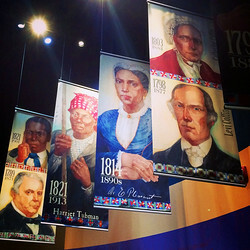 We visit (virtually) the Underground Railroad Museum, the Taft Art Museum, the Cincinnati Music Hall, The American Sign Museum and the Cincinnati Museum Center. Even if you have never been to Cincinnati you might recognize which of these was used as a model for DC Comic’s Justice League’s Hall of Justice. We learn that in Cincinnati they fight about who has the best chili (which they serve on spaghetti), propose sometimes with donuts from Holtman’s Donut Shop and host the world’s second largest Oktoberfest. Cincinnati and the area nearby produced astronauts and presidents (including the largest and the one who served the shortest term), leaders in the abolition movement and the real “Great Gatsby”. John A. Roebling used Cincinnati to warm up for the building of the Brooklyn Bridge. From parks, to passenger pigeons, from theatres to tombs, from the river to the Red Stockings, learn about this beautiful city on the banks of the Ohio.